Karnataka Forest Department Recruitment 2018 - Apply Online for 94 Forest Watcher Posts in Karnataka Forest Department, Karnataka Forest Department, Karnataka. Online Applications are invited by Karnataka Forest Department from 11 Jun 2018 to 10 Jul 2018 for 94 vacancies. Karnataka Forest Department Mysore Circle – Forest Watcher- 2nd Final Selection List: Karnataka Forest Department has announced the Result on 07 Jan 2019 for Karnataka Forest Department Mysore Circle – Forest Watcher Exam 2018 . 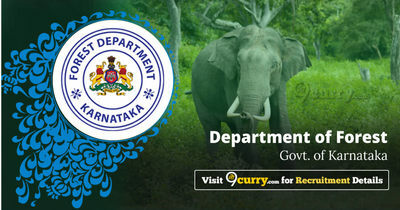 Eligible candidates may apply online at Karnataka Forest Department's website (direct link is given below) from 11 Jun 2018 to 10 Jul 2018. Candidates log on to http://www.aranya.gov.in/.